The term infestation is generally used in the context of pests or parasites on crops, livestock, and humans. Honeybees are far from being pests, but Honey Bee Infestations are a genuine problem experienced by many countries, particularly the warm ones. Some of you might not be happy with the use of this word infestation for honeybees since they neither feed on our crops, our livestock, or on people. For that reason, then why treat them as pests and what do we mean by Honey Bee Infestation? This article will attempt to answer those questions. Parasite or pest means an external agent that uses its host to derive nutrition and in the process harms the host. Similarly, an infestation means inhabiting a place in such a large number that it poses a threat to other species thriving there. Honey bees are neither parasites nor pests, so why do we call it a Honey Bee Infestation and why are we so worried about it? Normal Behavior: Seeing a few honey bees buzzing around your house and in your garden is nothing to be worried about. Even if there are very few honey bee hives in your locality, such as some hanging down the trees and some in abandoned, uninhabited places, there is nothing to concern yourself about. It is also not a problem if one of them ever stung you. That is normal and can in no way be called a Honey Bee Infestation. Honey bees become a big nuisance and a threat for human beings and other animals when they start inhabiting localities in abnormally large numbers. Often, this results in unwanted encounters, which are far from pleasant experiences. What’s more, these encounters sometimes turn fatal for the victims of honeybee attacks. Such a situation is an example of a typical case of honeybee infestation. They start building their hives in almost every possible place; in the cracks of walls, in attics, in boxes, in pipes, in ventilators, in shades, on trees in your garden, in garages, and in every other place you can think of that has been untouched for only a few days. You will be astonished to know that honeybee hives were even found in the barrels of guns that were not in use. Unlike common pests or parasites like locusts, mosquitoes, and rodents, honeybees don’t spread disease, nor are they damaging our crops or sucking our blood. On the contrary, they benefit us by providing honey. The fact is that humans are the actual parasites of these bees since we rob them of their hard-earned honey. So why are we afraid of them and want to drive them away from our vicinity? Because of their venomous sting that they carry with them all the time and their highly aggressive nature. At the slightest hint of any danger (or even simply apparent danger), thousands of bees swarm in and attack whoever or whatever catches their sight. The intensity of pain from these stings depends upon the amount of apitoxin they release and the intensity of the toxin. The biggest problem about honeybees is that you cannot fight them when attacked. They are small, fast and many in number, so the victim is stung dozens of times before it can even blink its eyes. Although an average healthy person can withstand as many as ten stings per pound of his body weight, an attack becomes fatal if the person is allergic to honey bees, bee stings, and bee venom. In that case, even a few stings can trigger severe allergic reactions in the victim’s body and the victim might collapse. Then, there is the pain, of course. In most cases, it was found that the victim did not die from the large quantity of the venom introduced into his body, but from the acute pain, which causes cardiac arrest. Therefore, honey bee infestation can really be a big problem. The very term ‘Honey Bee Extermination’ may sound like butchering a helpful friend who is restlessly busy in keeping the Earth green, the plants laden with fruits, the liquid gold honey in our lives, and rarely does any harm to anyone knowingly. The whole species of honey bees seems so selfless that one may wonder why on Earth anyone would want to exterminate the honey bees. What harm have they done to humans? Won’t it have very damaging effects on the environment and the greenery around us? Won’t it be an injustice against the noble task of pollination that these honey bees do tirelessly, and have been doing for millions of years? Where will we get that golden, sweet honey if honeybees are not around? Hundreds of such questions may arise when it comes to honey bee extermination. We shall try to address and answer as many of them as possible. The issue of a declining population of honey bees is so severe that in May of 2013, Russian President Putin warned the US president of the likelihood of global war due to a food shortage that may be caused due to the declining population of bees. Before we start, let me tell you that honey bee extermination is a truly condemnable act and I personally dislike it. After all the priceless contribution honey bees give towards our planet by keeping it green, pollinating the flowers of fruits, and supplying the whole world with that highly sought-after “honey”, the act of honey bee extermination seems really unjust. However, sometimes it is needed. But why?? Let’s find out. The Bitter Need: What I personally feel is that honey bee extermination should never be done unless it is obstructing our daily life adversely and posing a direct threat to us and our family. This threat, although not deliberate, can be fatal. Actually, honey bees and humans were not designed to live side by side, harmoniously with one another. This is just not possible due to their different natures, living habitats, and habits. Honey bees, however beneficial they are for humans, are a primarily wild species. However, one species, named Apis Mellifera, is said to be the most domesticated species, but that only means that it is the most domesticated among the wild ones since it lives close to localities and is often cultured for honey. It is so called because it is the most feared and are very aggressive. At the slightest disturbance or hint of hostility, they will launch a severe attack on the offender. Although this is rather instinctive and not deliberate, just their way of protecting their nests where their young ones are born and grown, many times this attack is so severe that it can be fatal for the victim. In the majority of these situations, the victim does not even intend to harm the beehive. This is a fact. Those who actually collect honey or harm the beehives are harmed less frequently by bee attacks while innocent people often fall victim. There are innumerable instances when men, women, children, and pets have died due to attacks by bees that had built hives in nearby trees or shade. At the slightest noise, smoke, heat, or even movement, these bees attacked those innocent people. It is events such as these that make some people clamor for honey bee extermination. The Severity of Attack: Each honey bee may look tiny and apparently harmless, but they should never be underestimated. The strength of their attack is not in their individuality but in their unity. If you are ever stung by a honey bee, you may be aware of how much it pains and swells. Even with that, an average healthy person can withstand as many as ten stings per pound of his body weight (this may vary depending upon age, physical condition, previous illness, etc.) and even a few more by a stronger or heavier person. However, what happens when thousands of bees attack someone out of nowhere and the poor victim does not even have the time to hide in a safe shelter or run away; the attack is so silent, fast, and unexpected. Added to this severity is the fact that each sting delivers a small amount of poison (called Apitoxin) into the blood stream. This poison causes severe pain and swelling even when experienced in a small amount. In heavy doses, the pain can become so unbearable that it can cause choking, breathlessness, paralysis, cardiac arrest, and even death. At these times, these bees become more dangerous to us than beneficial animals and honey bee extermination becomes necessary. There is another danger as well. Sometimes, even a single sting can be fatal for a person who is highly allergic to honey bees and honey bee stings, and there are innumerable people like that in the world. Being allergic to honey bees (stings) is very common, particularly in predominantly cold countries. The Extermination: Honey Bee Extermination means a mass elimination of honey bees and a destruction of their colonies near human settlements to avoid any unwanted situations or encounters. Sometimes, this also means the destruction of their hives but not killing the bees, so you are simply exterminating their colonies and not the bees. This hopefully discourages them from building their colonies near human populations again. Although this also involves some bee casualties, that loss is negligible, while the rest of them are saved. Prevention First: As they say, “prevention is better than a cure”. 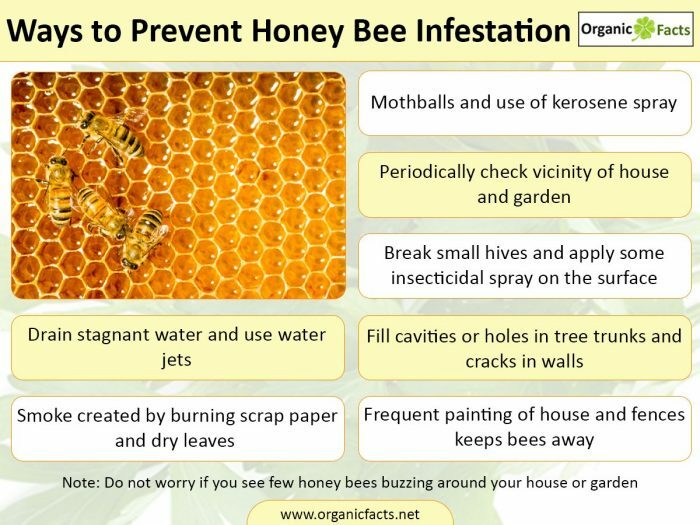 Here are some preventative measures to keep honey bees away from building hives in your locality. Periodic Surveillance: Periodically check the vicinity of your house, particularly those places that seem favorable to bees, such as the branches of trees, shades, cracks in walls, attics, old untouched garbage, rooms, and chimneys that are not in use. Early Solutions: Eradicate the problem before it grows too large! If you ever see even a small hive, disturb it or break it and apply some insecticidal spray on the surface. This will prevent them from building their hives in the same place again. Fill it! Shut it! : Fill the cavities or holes in tree trunks and cracks in walls; shut open boxes and containers that are not in use for long; shut the openings of pipes and chimneys that are out of use. Cut Their Supply: It has been shown that honeybees often build their hives near sources of water. Therefore, drain out any stagnant water that has accumulated in and around your house. Paint Them Out: Frequently paint your house and fences. The smell of paint keeps bees away. Smoke and Choke: Collect dry leaves, scrap paper, and anything else that creates a lot of smoke when burned and burn them once a week. The smoke will not let bees stay wherever it reaches, but what is great is that smoke reaches almost everywhere, so this is a very effective solution. Moth Balls: This old friend of almost every household is very effective in driving honey bees away. Just put one or two in every possible place and see the results. Smoke Version: Smoke is very useful in countering Honey Bee Infestations. If a few, dried red chilies are added, the smoke can work miracles. It will drive the bees away from every corner in and around your house. Kerosene Spray: The smell of kerosene oil cannot be tolerated by most insects and it serves a dual purpose. If sprayed even in small quantities near the hives, the bees will fly away. If sprayed on the hives (with proper precaution), most of the bees will either die instantly or sometime later. However, the honey in the hive no longer remains usable. Kerosene is also very cheap as compared to other insecticidal sprays. Water Jets: You can also drench the bees with heavy jets of water. This is not the most effective solution and might anger the hive, but it still works. Capturing the Queen: In this method, the queen is captured and is moved away. Wherever she goes, the swarm follows. However, professionals should be the only ones to do this, since it involves intense contact with the hive. Capturing the Bees: There are some techniques for capturing bees as well. In this, a queen is bought and put in a box with a small opening that looks like an inverted cone. The box is then kept near the hives. Most of the bees will enter the box. The box is then sealed and transported elsewhere. The old hive, with very few bees left, can then be handled more easily. After knowing all that you have just learned, even if you still want to exterminate the bees, there are several techniques you can use. Since there are more bees in a typical hive than you can even count, it is not possible to kill them one by one when it comes to honey bee extermination. You need some means of mass destruction. There are many such methods and most of them involve the use of toxic pesticides. Although I have listed them here, I have tried my best to separate the methods into Organic and Non-Organic methods. Here are some methods which do not involve the use of chemical pesticides. This is one of the crudest methods and involves a lot of risks as well. This also does not discourage the bees from building hives in the same place again. Before applying this method, you must move your family members away from the targeted hive to a safe distance if the hive is inside the house or in the attic. Or, you can shut your family members inside the house with all the windows and ventilators sealed if the hive is outside. Now, if you are interested in doing this yourself, you will need an axe, a bag, and a sting-proof outfit, perhaps a beekeepers outfit. Now, get dressed properly, grab the axe and the bag, walk up to the beehive or use a ladder to reach it, approach slowly, put the bag on the hive and remove it from the base using the axe so that it falls in the bag. This should be done very swiftly and during the night because the bees are least active then. Now, tie up the mouth of the bag and dunk it in water. Most of the bees will die this way and the few that escape will find a new home somewhere else. Note: Do not try this if you are not sure you can do it. Since this involves a lot of risks, the best thing would be to seek the service of professionals. Since this kills most of the bees, it is not recommended. The hives can be directly removed by any other method as well, depending upon the time, situation, and availability. This is a very effective method for driving honey bees away from their colonies and is equally effective for both enclosed and open areas. All you need is some dried red chilies and some firewood. Now, after securing yourself and your family members as discussed above, light the wood, and wait until it produces a lot of smoke. Now put the dried red chilies in it. This will give out a lot of pungent smoke that will drive the bees away. When they are gone, you can safely remove the hive and enjoy the honey inside of it. This is a very good method because it does not involve almost any killing of the bees. This is yet another safe method that is employed for honey bee exterminations, particularly in cases where the bees build their hives inside walls and come out through cavities or cracks. Basically, this involves trapping the bees with the help of a one and a half foot-long wire mesh cone with an opening in its apex small enough to let a single bee pass through it at a time, and a queen bee placed in another artificial hive or a box. The cone, with its wider end, is placed on the vent, while the smaller end opens into the box containing the queen. Most of the bees from the old hive in the wall will be attracted towards the new queen and will fill into the box, which can then be sealed and disposed or used for apiculture. The few bees remaining in the old hive in the wall can be taken care of with the help of either chilly smoke or fire. You can also use some pesticide on it, but that will spoil the honey, if any, that is left in the hive and it is not an organic way of removing honeybees either. Thereafter, when all the bees are gone, remove the hive, extract the honey (if any), and seal the vent so that the returning bees cannot build another hive there. The non-organic methods of honey bee extermination largely use pesticides in different forms. These methods of honey bee extermination are neither good for the health of the people living in the area nor for the environment. However, methods are methods. Here are a few of the most common. As the name suggests, in this method, the hives are sprayed with insecticidal solutions that kill most of the bees. Since they are highly poisonous, a lot of precautions should be adopted by the people living around the hives on which the insecticide is to be sprayed. The dust is applied around and on the hives and the bees that come in contact with it die. One such dust is Carbaryl or Sevin dust. This is making fumes of insecticides to kill the bees or drive them away. Note: Once the hives are applied with the insecticides, the honey from them should never be consumed. Furthermore, people (especially small children) should be kept away from the reach of these insecticidal dust, fumes, or sprays. Once an area is applied with any of these, the bees do not generally return to rebuild their hives on those places due to the highly noxious odor and toxins that these insecticides release. Whenever you are about to start a honey bee extermination, you should inform your neighbors and family well in advance and help them secure themselves in safe shelters. Once provoked, the angry swarms can cover a large area. Therefore, it is always good to call professional exterminators for honey bee extermination. The Verdict: The best honey bee extermination methods are those that kill the least number of bees and do not let them build hives again. Still, honey bee extermination should be avoided as far as possible. You don’t need to panic during the extermination of honeybees if you see a few bees around your house or in your garden every day, because this is normal. You need to worry only if you find some hives in your window shades, roofs, vents in the walls, in your attic, or on some tree in your backyard or garden. As far as I am concerned, I have a big hive hanging just outside the window of my office and it never troubled me. I just do not disturb them and they do not bother me. Honey bees are not looking for preys. There is a scientific explanation of their attack strategy as well. When you are scared, your body releases some specific pheromones that are easily sensed by animals and insects and they understand that you are up to something dangerous. This alerts them and they attack the source of the pheromones. This is not just true with bees, but all animals, including dogs and wolves. Basically, do not panic and they will not react. Honey Bee Extermination is certainly not always the remedy for Honey Bee Infestation. Extermination becomes essential only when the honey bees cannot be driven out of the locality, perhaps due to the position or location of their hive or due to safety concerns. The best solution for Honey Bee Infestations is to drive the bees away from your vicinity with a minimal killing of the bees. General Guidelines: As you know, bees can be dangerous, so you need to keep the following points in mind before launching an attack (more so when you are doing it yourself). Get a good protective suit. While using insecticides, be sure to avoid their contact with hands, mouth, or their inhalation, as they are highly poisonous. Always keep children away from them. Before starting, secure your house well so that the angry bees cannot get in. Before lighting a fire, make sure that you have arrangements to control it. Do not forget to put it out completely after you are done. Inform your neighbors and put signs out for people who might be walking near the extermination site. Try to avoid killing the bees, unless it is completely necessary. The best time to do this is at night when the bees are mainly inactive. Do not try to do this yourself if you are allergic to bees. Call an expert if you find yourself unable to handle the situation.